I am obsessed with capes. I don’t remember how and when it started, but all I know is that I am obsessed with them. Let me tell you, I love all clothes and collect them in few categories, but when it comes to capes it’s a whole different story. 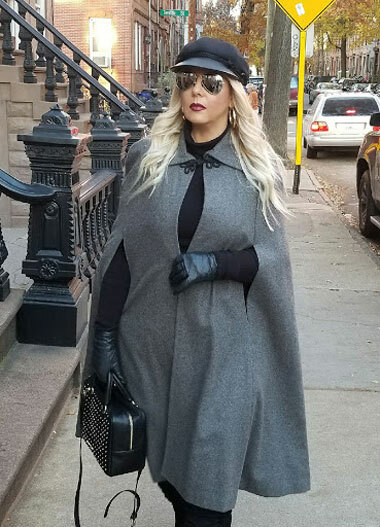 I found one of my all time favorite capes many years ago in a vintage store in Manhattan and every time I wear it, people will literally stop me on the street. I still have it and wear it every winter and will get the same reaction every single time. I love the color, I love the style and the price was amazing too. The owner gave me sweet little discount and made my day even better. The day I was ready to wear it, I was not sure where I wanted to shoot my look, then it hit me, the charming streets of Hoboken, NJ are the perfect background to showcase this beauty. Here is the perfect place to mention few more things on how to wear vintage, but look current. I love vintage pieces, but don’t like to have a vintage look. In order to achieve that, I only wear one vintage piece at a time, everything else has to be modern. In my case here are all the other elements of my look. New and on trend. My jeans are from Target ( you have seen them many times, they are the best jeans ever ), my over the knee boots are Elie Tahari a penny find from Nordstrom rack, turtle neck is Zara and my bag is Karen Millen. By now you know I find everything on sale or from sample sales and some of the styles are not available, but I linked similar pieces below in case you want to recreate my look.